Despite "Enrollment Cap," BYU Growing. Can or Should it Grow by Much More Though? "...he thinks the school needs to significantly expand the number of students. He was saying there is no reason we shouldn't be like a Big 10 school with 60,000+ students. He argued that the purchase of the old Provo High should help create the room to really increase enrollment." While I think everyone (including Coach Sitake) realizes that increasing enrollment to 60,000+ (nearly double current enrollment) is simply impossible in the short-term, is it actually “do-able” as a long-range goal? Such a change would certainly require large combined doses of creativity, land acquisition, vision from leaders, and sacrifice/effort from those who work/live around campus. But, as a “what if” exercise, let’s explore some of the advantages and drawbacks of significantly increasing enrollment in Provo. I will list some potential advantages first and discuss them. At the end of this piece I will list several drawbacks to such changes. Further installments will explore these “cons” and address them in greater detail. More good, smart LDS kids can have the “BYU experience” (AKA “Mormon Immersion”) while they obtain an elite and career-enhancing education/degree. Increasing enrollment enlarges the alumni base with the associated benefits of raises the school’s profile and fundraising capabilities. This would also continue to enhance the visibility of the LDS church via its flagship university. More BYU graduates is an investment by the LDS church in it’s own future by producing high-earning & active church-goers who are very likely to pay a full tithe of their income. Increased fan-base with consequent improved TV viewership and attendance at Cougar sporting events (national trends in college football attendance have been steadily declining for nearly a decade). It is largely expected that a major realignment is coming with “Super Conferences” (Other ideas here, here, here, and here) that will continue to widen the gap by drawing the vast majority of the attention and money to the affiliated schools. An increased enrollment and fan-footprint will help make BYU “un-ignorable” when such changes take place. “Making the cut” into a Power/Super conference would bring in a massive amount of money to support the institution beyond athletics as well. These programs also raise the visibility of the Y and its sponsor. More students could pursue the training they desire at BYU. Some popular undergraduate programs at BYU (Business and Nursing for example) reject over half of their applicants. This represents many hundreds of current BYU students who, despite being accepted to BYU, have to “re-invent” themselves after this rejection (which can occur after being a student for a few semesters.) As the student body gets more and more academically qualified, there should be a major enlargement of these programs to meet the demand. More BYU students should be able to train in these very employable and fairly lucrative fields. As Salt Lake City (and Utah in general) continue to be attractive relocation destinations for families and businesses (Silicon Slopes), the state may continue to trend toward a lower percentage of Latter-Day Saints. Having huge and dense population centers of LDS at BYU and BYU-Idaho can preserve the “Mormon Immersion” experience as they simultaneously serve as bulwarks of strength for the LDS church. The university has brought much favorable notice to the Church….. Its academic programs and its athletic programs have both brought honor to the university and the Church. And as generations of students move through its halls and on to graduation and then out across the world, they will bring honor to their alma mater and its sponsor, The Church of Jesus Christ of Latter-day Saints. We shall continue to support BYU and its Hawaii campus. We shall continue to support Ricks College [now BYU Idaho]. We are not likely to build other university campuses. We wish that we might build enough to accommodate all who desire to attend. But this is out of the question. They are so terribly expensive…. … if we cannot give [a BYU education] to all , let us give to as many as we can. The number who can be accommodated on campus is finite, but the influence of the university is infinite. Tremendous efforts are being made to enlarge and extend that influence. This was a rare public and candid snapshot into how church leadership viewed BYU’s role and purpose over a decade ago. It is likely that many of these principles still stand in effect today. Church leadership wants to allow as many as possible to have the “BYU Experience.” This is a mutually beneficial arrangement for many reasons. Granted, we should assume some degree of “selection bias” contributing to the top-line finding about BYU (and other church schools) since those individuals who are attracted to a BYU environment are probably more likely to be “all in” with regards to church/activity in the first place. Add to that the high likelihood of finding and marrying a like-minded spouse while there and it seems to create a positive perfect storm for life-long activity. Even so, if graduating from BYU (any of the campuses) is the top predictor of life-long activity in the LDS church, wouldn’t leadership want to grow and expand enrollment? Speaking in pure utilitarian terms: more graduates = means more highly-educated active church members = more tithing dollars. That represents a virtuous cycle of growth and financial stability for the LDS church and its membership. There’s also evidence that Latter-Day Saints buck national and worldwide trends in that the more education and income we have, the more likely we are to be devout believers/weekly church-goers and have more children. Research even directly shows that the more education a Mormon has, the more likely we are to pay a full tithe. Educating and graduating more students from church-sponsored university’s would therefore prove to be a wise long-term investment in church sustainability and growth. As of Spring 2016, BYU had 412,467 living alumni. If we assume that each graduate contributes an average of $5,000-$7,500 yearly in tithes/offerings, that’s around $2-3 Billion/yr of operating income for the church coming just from BYU graduates. We have witnessed marked growth at BYU-Idaho from ~14,000 students in 2000 to nearly 23,000 by 2009 and well over that now. Currently, the Rexburg campus serves over 29,000 students annually, but these figures are aided by the three-track system; actual on-campus “head count” enrollment at BYU-I is currently 21,672. While on a much smaller scale, there are also plans to increase BYU-Hawaii’s enrollment by almost 20% (to 3200). In addition to obvious and announced growth on the other BYU campuses, I’ve concluded that BYU and the Board of Trustees (BOT) have actually also been making measured moves towards growth in Provo for quite some time. The data show that both actual enrollment and building square footage are clearly on the rise at BYU. 1970 — The board establishes an enrollment cap of 25,000. 1976 — The enrollment cap is increased to 27,000. 1997 — Enrollment cap rises to 29,000. Looking at other historical BYU enrollment figures that I’ve gathered from various sources the undergraduate enrollment has gone from 27,460 in fall 2005 up to 30,395 at the start of this academic year. That’s an over 10% increase in just over a decade. As a side note, undergrad enrollment dipped to 26,392 in 2014 in consequence to the change in missionary ages, but has since been recovering. The most recent enrollment figures actually show that BYU is currently at it’s highest figures on record for both graduate and total enrollment at 3,052 and 33,469 respectively. Working the numbers backwards, the total enrollment in 1997 was 27,000 and is 33,469 today. That’s a 24% increase over 2 decades. Other sources put BYU’s total enrollment at “more than 34,000”(Mormon Newsroom) in 2014 and undergraduates at 32,000 in 2013. If those sources are accurate, the estimated growth is even more than calculated above. In any event, we are dealing with enrollment numbers far above the last publically stated cap of 29,000. It’s clear that BYU’s enrollment is rising. Further confirmation of these upward trends, and likely pointing toward further ongoing growth, is found by tracking total applications and admittances to BYU. A 2014 Daily Universe article stated that both applications and rejections had reached an all-time high. In 2016, BYU accepted more applicants (7,171) than any published figure I had seed before that point. But even this record was surpassed by the most recent (2017) applicant class where new records were set in the number of applicants (13,700), and acceptances (7,300). In contrast, there were 8,694 applicants and 6,785 acceptances back in 2005. It appears that both supply and demand for BYU enrollment are increasing. Although I don’t have the actual figures/scores that BYU Admissions is working with for the entire applicant pool, I would suppose they could potentially admit thousands of more students per year without dropping the average scores precipitously. Currently the BYU scholarship matrix shows that a newly admitted freshman with a 34 ACT and 4.0 GPA is only granted a 2 semester scholarship; 35 and 3.78 only get a half-tuition break for 2 semesters; a 32 and 3.89 gets no scholarship. BYU is obviously not hurting for good applicants. Additionally, as that same article details, the LDS church purchased The Riviera apartment complex in 2013 (approximately 5 acres located very close to the football Stadium). Tallying up these acquisitions (excluding the 81 acres on Y-mountain), BYU has moved to acquire at least 38 usable acres in the last 5 years. This will enlarge the total campus size from 560 to 598 acres, a 7% increase. Many local property owners are also under the impression that BYU always seems to be looking to purchase any properties that come up for sale within a block or so from campus. Even on a micro scale, BYU purchased the home (and adjacent lot) facing the traffic intersection between LaVell Edward Stadium and the Marriott center after it was damaged in a motor vehicle accident. It currently sits as a grass-covered vacant lot. Tangentially related, one controversial developer, BYU Engineering graduate David Hall, who grew up in that same Pleasant View neighborhood has already purchased 20 homes there with plans to acquire more despite strong opposition from the current neighbors (Using this map feature in conjunction with Hall’s LinkedIn profile you can see the properties he’s purchased via 3 companies: Tracy Hall LLC, DRH Holdings and NewVistas Foundation.) His stated vision is to develop a higher-density planned-community that could house thousands, with a strong emphasis on communal spaces. One interesting idea is that he could potentially serve as a “stalking horse” for BYU eventually acquiring that neighborhood which is essentially already surrounded on 3+ sides by BYU campus and/or the MTC. Looking at campus building construction trends, especially total square footage, can further help answer the question of whether or not BYU is growing. In 2015, there were 268 buildings accounting for 9,147,666 total square feet. Currently (2017) there are 269 buildings accounting for 9,447,820 total sq ft. Once current constructions projects are completed (2019), there will be 273 buildings and a total of 9,907,306 sq ft. That’s a net increase of 5 buildings and 759,640 sq ft (representing over 8% growth) in about a 5 year period. A web search showed BYU had 8.7 million total sq ft around 2001. That would indicate a 14% increase in square footage in just over 15 years. Also, for reference and perspective, BYU-Idaho has a current (Feb ‘17) square footage of 2.5 million, four times less than BYU. With a current enrollment of 21,672, that averages out to 115 square feet of building space to each enrollee in Rexburg. In Provo, there is just over 296 square feet per enrollee. While projects already under way eventually will add a total of 611,000 square feet of building space, BYU in the future will operate under a policy that allows new buildings only if an equivalent amount of square footage is made available by removing older buildings. That rule probably won't include a new alumni house and the indoor athletic facility, however, since those buildings would be paid for and operated with private funds and donations. Interestingly, this quote implies that such a “square footage cap” would be due to operating costs more than anything else, since buildings that can be “paid for and operated with private funds” would be exceptions to the “rule.” Although, it’s been nearly 20 years since that quote, it seems that this policy may still be in place. The Engineering building currently under construction is listed at 200,000 sq ft and the $80 million cost was raised completely in donations prior to breaking ground last year. The new Marriott Center Annex was also completely funded through private donations as were the 100,000 square foot Museum of Art, the indoor practice facility, and the Hinckley Alumni building several years ago. On the other hand, one might reasonably take the perspective and argue that if BYU/BOT is paying large sums of money to acquire new land (Provo HS cost $25 million) or forego lease benefits (RCC driving range) that they would, likewise, be willing to invest in developing such properties. Diluting the quality of the “BYU experience” for the student body and/or diluting “the product” of a highly qualified BYU graduate. Largely addressed above with data showing increasing ACT/GPAs despite increased acceptances. How adding BYU/Cinci is a recruiting coup for the Big12. And why Houston's not. 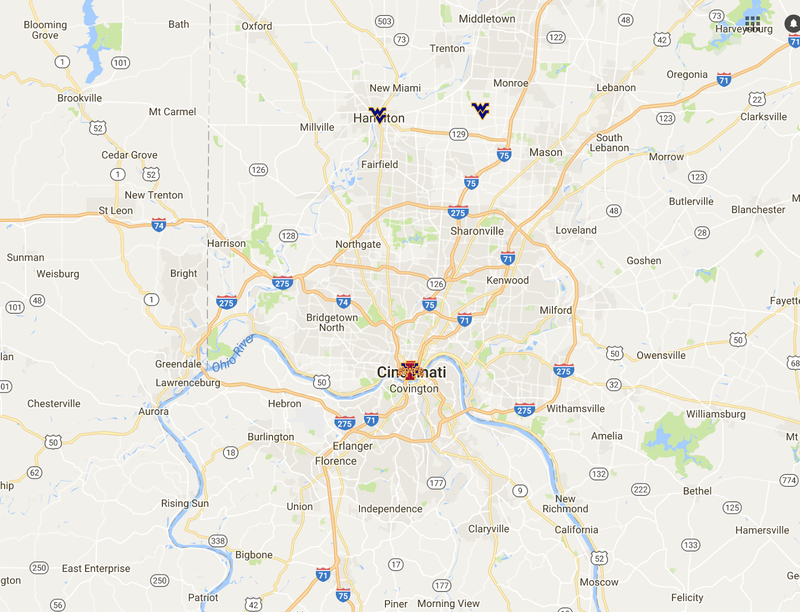 This link provides a LOT of great up-to-date info on the current geography of FBS recruting. First consider the national "heat map" and pay special attention to TX (Houston especialy), OH, and UT. Also notice that the Wasatch Front is a more impressive recruiting producer than larger western cities than Seattle, Portland, Vegas, and even Denver. That's pretty impressive. Another interesting point is that Atlanta and Miami are the only two cities that are distinctly "hot" (orange or red) for EVERY P5 conference. Those are cities that every big school tries to recruit. The first thing that sticks out is how well the Big12 recruits and dominates it's own footprint ... espcecially the I-35 corridor (San Antonio,Austin, Dallas/FtWorth, OKC, Kansas City). However, all the P5 conferences dominate their own footprint. One thing to consider is how effectively or ineffectively the Big12 currently recruits the host cities/states of the 3 top expansion candidates: BYU, Cinci, and Houston. Houston is they second "hottest" spot on the map, only trailing Dallas/Ft Worth. Now look at Cincinnati back on the national map and see that it's the "hottest" FBS recruiting city in Ohio (looks tied with Cleveland). Now look at how Big12 recruiting is doing in Cincinnati below. That's right, the Big12 only has 5 total players (3 tightly bunched) from Cincinnati. 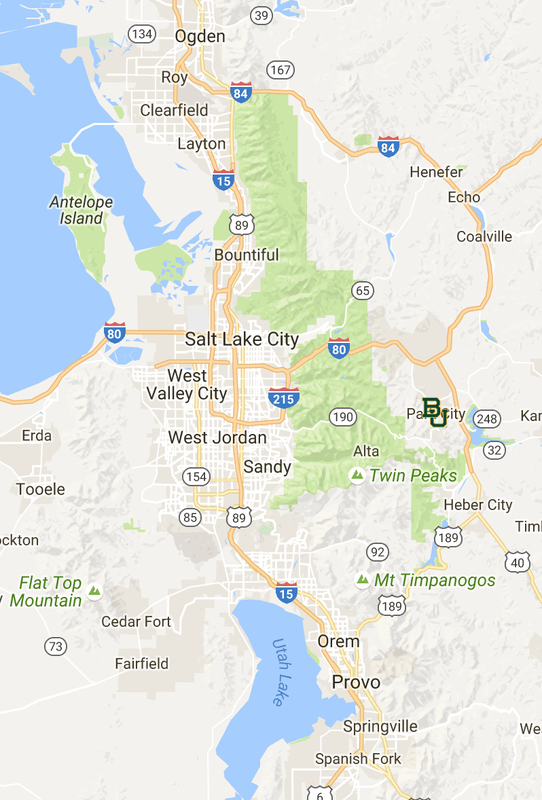 The Baylor kid from Park City is THE ONLY kid from Utah currently on a Big12 roster. My point here is not that the Big12 needs or wants to go out and start recruiting these areas (though that wouldn't hurt), but that these represent essentially untapped markets for the conference. By expanding their footprint to include teams from Utah and Ohio the Big12 is truly opening up new and fertile recruiting grounds. By adding BYU especially, they are adding a team that will give them essentially ZERO relative competition within their current I-35 recruiting corridor. Even further, adding BYU puts more recruiting competition pressure on another P5 conference (the PAC12) since the LDS base is mostly (80%+) within the footprint of the PAC12. Granting official P5 status on BYU will result in even more recruiting pressure to win head-to-head battles with PAC12 schools on top western recruits. In reality, all three schools are located in GREAT states for per-capita recruiting. Texas is 7th, Ohio is 8th, and Utah is 9th (interestingly, OK is right there in 10th) for the best states in the nation for producing FBS recruits. This data is a slight change from another similar recruiting geographical analysis from 3 years ago. Notice that those same 4 states were grouped together again, but the group, en toto, moved up a spot and the order shuffled with Utah jumping over Oklahoma. 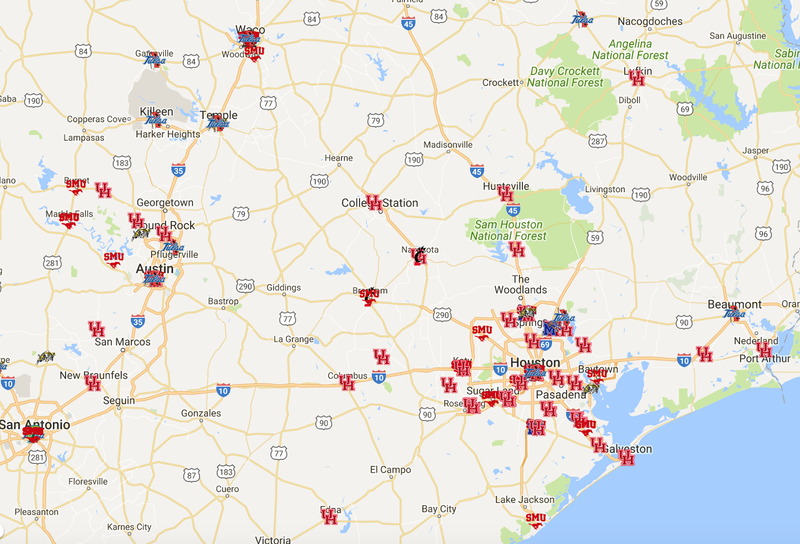 Drilling down on Houston shows that they get nearly ALL their recruits from within a 200 mile radius. Below is a map of AAC recruiting of the Houston region. 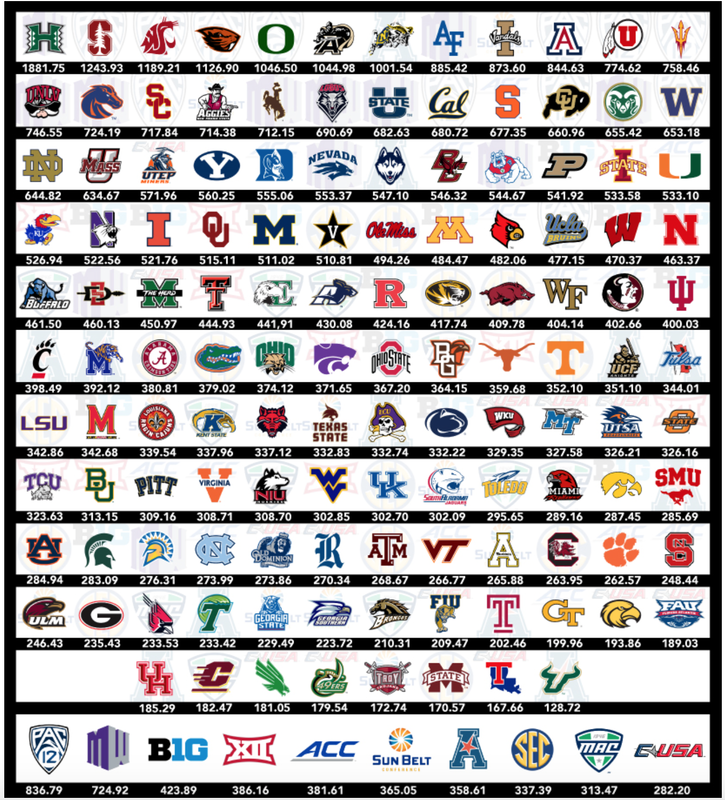 Further confirming this small footprint idea is the evidence that Houston is 7th out of all 128 FBS schools in the least average distance from home a schools' recruits come from. Part of this is geographical as the western schools tend to have the longest distance while the south-eastern schools have the shortest distance. My point is that adding Houston adds another level of competition for the current 10 Big12 schools within their 2nd most recruited city in the nation. I don't think they want that, do you? Conversely, my perusal of the map shows that UH only drew 7 players from the massive recruting market of Dallas/Ft. Worth. Elevating Houston to P5 status would instantly create another "mouth to feed" and make recruting that city that much harder. Ask Texas and Charlie Strong if they're enjoying losing recruiting battles to TCU. That's yet another reason I think that the whole "UT/TTU want Houston" movement is just a political nicety ... playing nice and saying the right things in public for the hometown kid, but not really wanting/planning to invite them to the dance. I know people at OSU and KSU are on the record saying that they don't want Houston in the league because it would make it harder to recruit the best kids out of Houston. I tend to trust these professionals on this opinion. 2) The data here represts recruiting largely from 2010- present, so there may have been some trend shifts more recently that comparative year-by-year data may reveal. Born and raised in Los Angeles area (Glendora High School). College @ Brigham Young University. Medical School @ UAB in Birmingham. Residency in Ophthalmology @ Med. College of Georgia. Vitreoretinal Surgical Fellowship @ Univ. of Iowa. Practice now in Birmingham and Tuscaloosa mainly. Wonderful wife, Laura and I were married in Georgia in 1999. Five energetic boys and one little girl have followed. C-Span Archives: Speeches in S.C., N.H., & Mich.